With a gracefully curved frame, crystal accents and six candelabra lights, this silver leaf chandelier is an elegant addition to traditional style decor. This silver leaf chandelier features six classic candlesticks dripping with crystal accents. The curved wrought iron frame shimmers slightly in the light. With elements of traditional and contemporary style, this design from the Manning collection by Crystorama, will complement most living rooms or dining areas. 32" high x 26" wide. Canopy is 6" wide x 1 1/4" high. Weighs 20 lbs. Uses six maximum 60 watt or equivalent candelabra bulbs (not included). 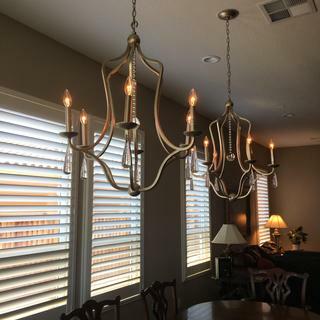 Silver leaf 6-light chandelier from the Manning collection by Crystorama. Installed two of these above our long dining table. Beautiful. The finish looks silver in some light - but mostly looks more like a champaign color in our room. Very pretty. Very happy with them. We like having a little bling, but not overwhelming.